This volume contains 55 of the 62 papers, plus three alternates, from the 26th West Coast Conference on Formal Linguistics (WCCFL 26), which was held at the University of California, Berkeley on April 27-29, 2007. The authors present new work in syntax, semantics, morphology, and phonology. The proceedings includes papers from two invited talks: “How Many Grammars Am I Holding Up? Discovering Phonological Differences between Word Classes” by Adam Albright, and “Processing Ellipsis: A Processing Solution to the Undergeneration Problem?” by Lyn Frazier. The 32nd annual Boston University Conference on Language Development was held November 2-4, 2007, in Boston, MA. The proceedings contain 51 of the papers presented at the conference, including the keynote paper by Ellen Bialystok and the plenary paper by William O'Grady. The two-volume set covers a wide range of research in language acquisition and language development. The complete table of contents can be seen on the Cascadilla Press web site. The posters from the conference are not included in the printed proceedings, but many are available from the conference in an on-line proceedings supplement. We have expanded our CafePress shop, where we sell linguistics posters, apparel, teddy bears, and more. 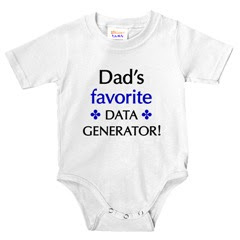 By popular demand, we’ve added new versions of many of our classic items — “Mom’s Favorite Data Generator” can now also be “Dad’s Favorite Data Generator” — as well as entirely new items like mugs, mousepads, and shirts featuring the IPA vowel chart. It's the perfect place to find gifts for that special linguist in your life!